Tell us about Sons of Thunder...that's quite a unique name! Sons of Thunder was founded by two brothers, James and John, who were born in San Diego, but grew up in NYC. They have Hawaii and San Diego in their blood and so their menu consists of foods they grew up eating - poke, fish tacos, hot dogs - casual beach fare. Their focus from the beginning has been two-fold: 1) quality eats and service, and 2) fostering a caring culture where SOT team members can grow personally and professionally. About the name: The two brothers grew up being called the “Sons of Thunder.” It’s a biblical reference to James and John, two brothers and disciples of Jesus. They were trouble-makers of sorts, and hence the name, given in love, of course! What inspired you to open Sons of Thunder? Sons of Thunder first opened in October 2015 in Murray Hill on 38th and 3rd. We were supposed to be a West Coast style burger shop, with poke way down at the end of the menu. As fate would have it, we didn’t get our cooking gas from ConEd in time for our opening (it finally came 8 months later), and so we pivoted last minute and went with an all-poke menu. We almost closed because very few knew what poke was back in 2015. Ligaya Mishan of the New York Times, who is a native Hawaiian, came in three months after we opened and wrote a glowing piece. The rest is history! What's makes Sons of Thunder so unique? Sons of Thunder is unique in that we have staked our reputation on the quality of our offerings. 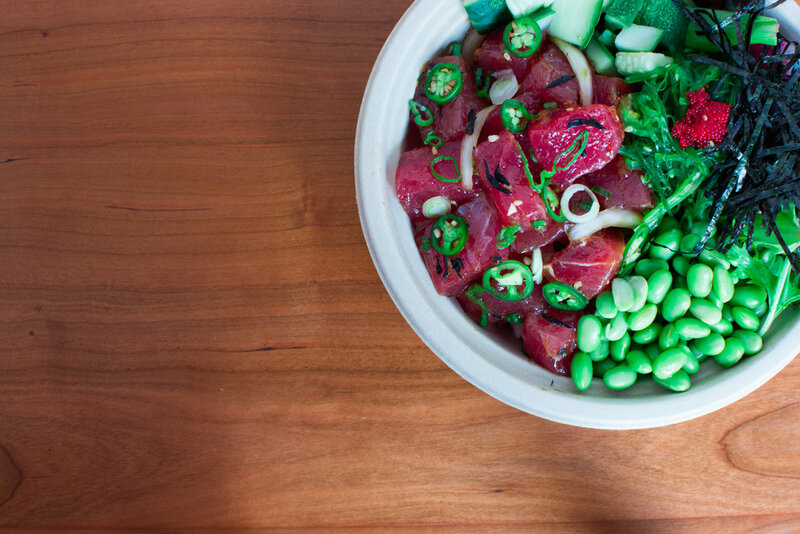 We only use fresh, never frozen or chemically treated fish in our poke. We buy whole fish and break it down every single day in house. Very few shops do this on a daily basis because it is quite expensive. Not everyone can tell the difference because of the way most poke shops drown their fish in marinade and toppings. We make the fish the star of our bowls. We offer few toppings and charge for them individually. Our hot dogs are organic, nitrate, hormone and anti-biotic free, with natural casings and really tasty. We make all our sauces, marinades, lemonades and teas in house. Our soft serve is organic. What inspired you to open in Financial District? The Financial District was a no-brainer for us because of the amazing vibe and density. We love the offerings already present in the FiDi and thought we could bring a slightly different fare and flavor that could complement the lunch and dinner scene. The FiDi population craves quick and healthy offerings, and we believe we offer that with quality. What are you favorite go-to dishes? Our favorite dishes at Sons of Thunder are the poke and the fish taco. I’ve had many versions of both, and we really believe that they hold their own. What are your other favorite local spots in the neighborhood? Our favorite downtown spots so far are Tomorrow, Pearl St. Diner and Dos Toros! All neighbors! We’re so lucky to be in the same neighborhood as these guys!